Last Thursday we Scots voted on whether we wanted to separate from the UK and be an Independent country. 97% of Scots who were eligible to vote registered to do so and over 3.5million people turned out to cast their vote. To say it was a tense night is putting it lightly. To say I needed a stiff drink to get me through it is an understatement of massive proportions. I suspect most Scots, myself included, experienced an amalgamation of excitement and nervousness, whichever way they voted. If like me, you sat up to watch the results come in, I truly hope you included a wee swalley to make the night pass quicker and frankly, dampen the boredom that is watching referendum results. Buckfast and Tenants may be the stereotypical beverage for a Weegie but this lass chose to see out the night in style with a spot of gin. I didn’t quite make it through to the end (that’s what 1/2 a bottle of Gin will do to you) but I consoled myself that no matter how it turned out the hangover on the morning after would ease the pain. 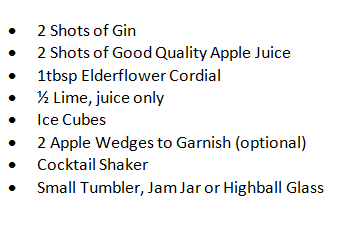 Apple juice, gin and elderflower cordial have never been very high up on my beverage listings but when you shake them together over ice, a strange and delicious kind of alchemy happens. Simply put, this is my new favourite drink. I first drank these with Irish Pal #1 at the Glasgow Wedding Collective A/W Bridal Showcase #GWCstyle (held by our Honorary Weegie Lisa at Palompo PR). Irish Pal #1 and I fell head over the heels with the cocktail although we thought it best to put some physical distance between ourselves and the cocktail decanters for fear of lying on our backs, opening the taps & letting it pour down our throats. If you think I’m being facetious you obviously have never seen the 2 of us in action at a party. I wasted no more time, bought the neccesary liquids and set about concocting my own version. 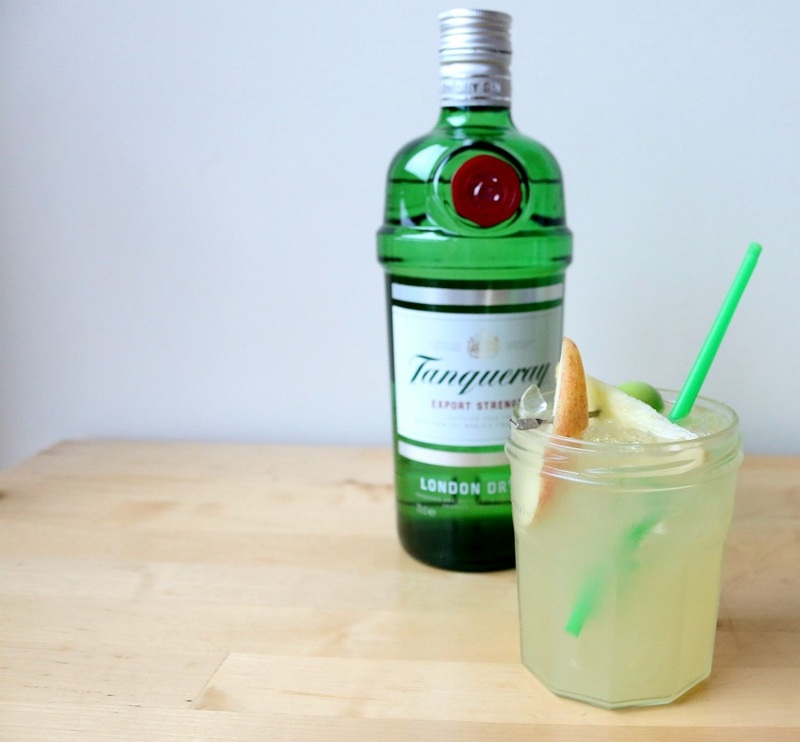 You don’t need to serve your cocktails in a jam jar but lets face it, there’s something appealing in it. This will make 1 drink and you can substitute the Gin for Vodka if you prefer. Ditch the fancy glassware & embrace the jam jars! First off invest in some good quality ingredients. When you only have a few items in a recipe it pays to make sure they are the best you can afford since these are all you’re going to taste. Gin – I recommend Tanqueray or Hendricks. Whatever you do, avoid the Gordons. Pricey yes, but there is a noticeable difference in taste making it a nicer cocktail to drink. Elderflower Cordial – I like the Bottle Green brand but Belvoir is equally good. Alternatively, make your own if you do that kinda thing. Apple Juice – Go for a cloudy or traditional style apple juice. Innocent or Copella are the 2 I recommend. Fill your glass with ice and set it aside while you prepare the drink. 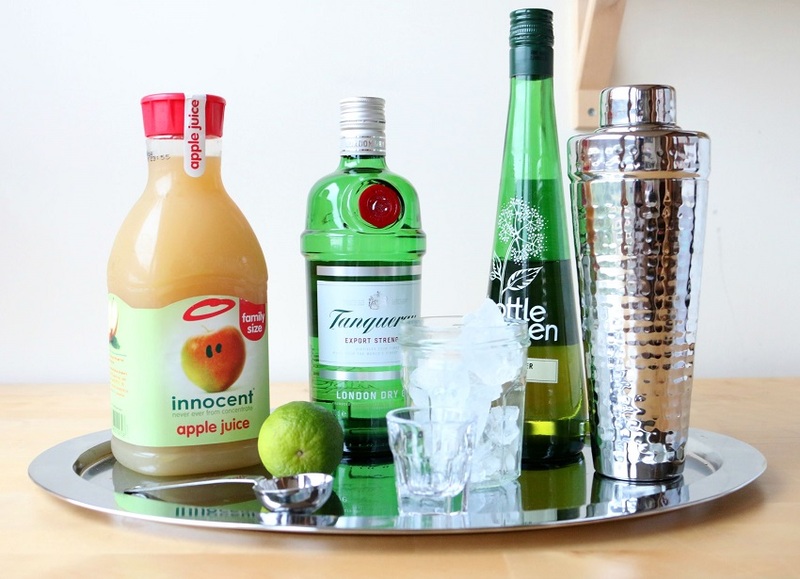 Add the gin, apple juice, elderflower cordial and lime juice to a cocktail shaker with 4-6 ice cubes. How MY independence referendum went down. Shake the cocktail shaker vigorously for 10 seconds. Strain the cocktail into the ice filled glass. 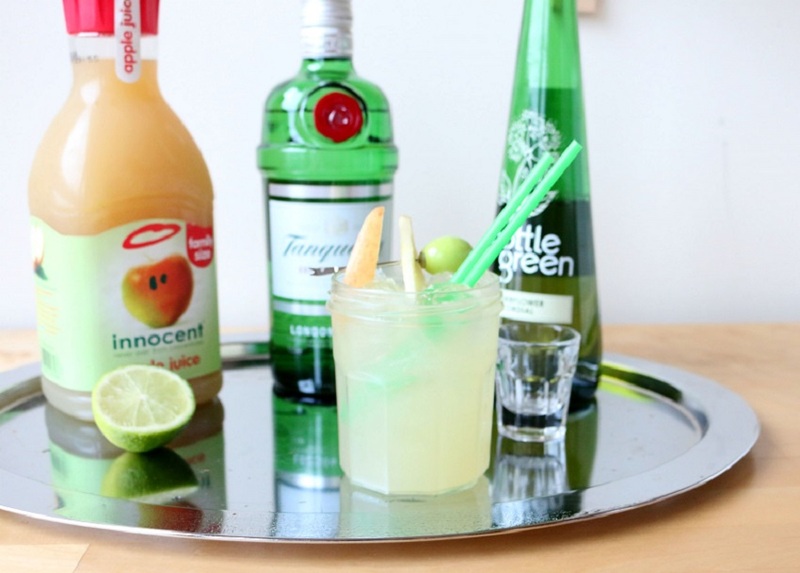 Garnish with a few apple wedges and a couple of straws. Sip gently and chillax. After a few of these, Political tension or anxiety will disappear.